by Barnett, Raymond A.; Ziegler, Michael R.; Byleen, Karl E.; Stocker, Christopher J. For one-semester courses in Finite Mathematics. 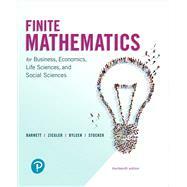 Finite Mathematics for Business, Economics, Life Sciences, and Social Sciences , 14th Edition offers more built-in guidance than any other text available – with special emphasis on prerequisites skills – and a host of student-friendly features to help students catch up or learn on their own. The text’s emphasis on helping students “get the idea” is enhanced in the new edition by a design refresh, updated data and applications, and a robust MyLab™ Math course. By combining trusted author content with digital tools and a flexible platform, MyLab Math personalizes the learning experience and improves results for each student. NOTE: You are purchasing a standalone product; MyLab™ Math does not come packaged with this content. Students, if interested in purchasing this title with MyLab Math, ask your instructor to confirm the correct package ISBN and Course ID. Instructors, contact your Pearson representative for more information. Raymond A. Barnett, a native of California, received his B.A. in mathematical statistics from the University of California at Berkeley and his M.A. in mathematics from the University of Southern California. He has been a member of the Merritt College Mathematics Department, and was chairman of the department for four years. Raymond Barnett has authored or co-authored eighteen textbooks in mathematics, most of which are still in use. In addition to international English editions, a number of books have been translated into Spanish. Michael R. Ziegler (late) received his B.S. from Shippensburg State College and his M.S. and Ph.D. from the University of Delaware. After completing post doctoral work at the University of Kentucky, he was appointed to the faculty of Marquette University where he held the rank of Professor in the Department of Mathematics, Statistics, and Computer Science. Dr. Ziegler published over a dozen research articles in complex analysis and co-authored eleven undergraduate mathematics textbooks with Raymond A. Barnett, and more recently, Karl E. Byleen. Karl E. Byleen received his B.S., M.A. and Ph.D. degrees in mathematics from the University of Nebraska. He is currently an Associate Professor in the Department of Mathematics, Statistics and Computer Science of Marquette University. He has published a dozen research articles on the algebraic theory of semigroups. Christopher Stocker received his B.S. in mathematics and computer science from St. John’s University in Minnesota and his M.A. and Ph.D. degrees in mathematics from the University of Illinois in Urbana-Champaign. He is currently an Adjunct Assistant Professor in the Department of Mathematics, Statistics, and Computer Science of Marquette University. He has published eight research articles in the areas of graph theory and combinatorics.